The President of Mexico just laid el smack down on Justin Bieber -- calling BS on the pop star after JB claimed the two had met before his concert this week, but Justin claims it was all an honest mistake. 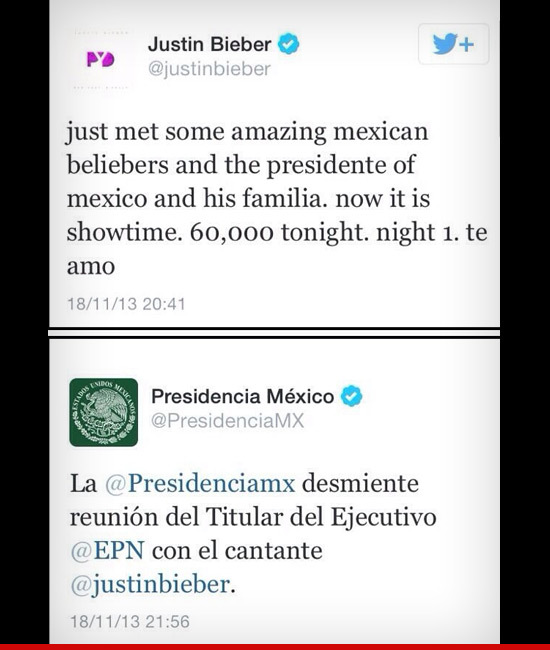 The drama began when Bieber went to Twitter on Monday and wrote, "just met some amazing mexican beliebers and the presidente of mexico and his familia." Problem is, he didn't meet El Commander in Chief Enrique Pena Nieto ... and Nieto's office went right back to Twitter to clear his name ... denying the meeting ever took place. Sources close to Justin tell TMZ ... it was an honest mistake ... because Justin was told that he had a meeting arranged with the "President's family." When Bieber met the group, which was surrounded by security and arrived in an official-looking motorcade, he was under the impression he was meeting the numero uno family. Justin Bieber -- Sniff My Pillow ... For $279K!